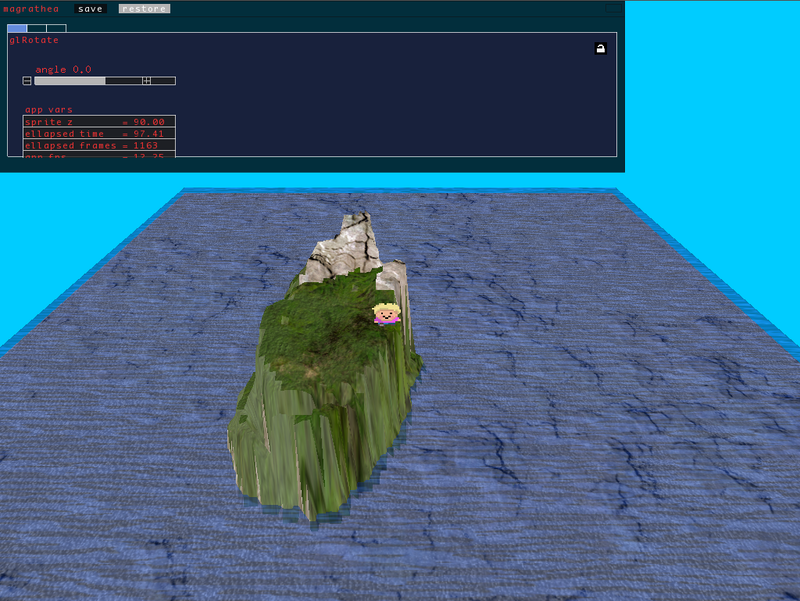 For my hard part done, I’ve solved the problem of how to insert characters into the landscapes. I’ve gotten 2D sprites that can move around the landscape, getting drawn at the correct level despite however the landscape is moving under them, and even scaling to different heights when they’re further away or closer. In this project, the x/y plane is rotated, so the grid the landscape is drawn onto is the x/y plane, and the rising landscape rises on the z axis. I had to first map sprite coordinates onto this coordinate system, then figure out how to draw them on the x/z plane, perpendicular to the landscape. As I’m not used to OpenGL, this ended up being a lot harder than it sounds at first. My next steps are related to how my project has evolved. At this point, I’m feeling fairly certain that I want to turn this project into a 2-player, cooperative game. One player will control an onscreen character with a controller, while another will build the terrain this character can walk on. The character-player will have to avoid falling into the water (lava? ), roaming flying enemies (birds? jellyfish? clouds of death? ), and other hostile monsters, and visit four different islands before returning to the starting location. The builder-player will build the paths the character-player can walk on, but will have a limited amount of resources to work with. By collecting falling objects, the character-player can unlock the ability for the builder-player to use more colors of clay to build with, making things easier for themselves as well. More interaction will be available, for example, the builder-player can protect the character-player by building a mountain behind him which pursuing monsters can’t get past (but blocking the characters own backward progression as well). Designing the enemies and interactions of this is probably my next task, and coding a few proof-of-concepts to test various gameplay mechanics. Also, I’ll probably be coding a basic color recognition/tracking system to allow me to turn off/on various colors of clay or colored blocks (or give them different effects). I’m VERY MUCH looking for any and all feedback on this, or just people to playtest stuff once I’ve got a build, so talk to me or comment on this or email me. (timothy at cmu dot edu).